Lever handles for doors are available in many different styles and finishes. To find the perfect lever for your home you can filter your results by brand, finish or style on the left. Because of varying design styles, door levers are often handed, meaning we need to know which way our door swings in order for the lever to curve up or down in the right direction on the door. If you don't determine the door handing you may have some door levers that curve up and some that curve down throughout your home. Many simple, or modern style door levers are not handed. Schlage and Kwikset levers have reversible handling which makes them easy to order and install. Lever handles can give your home an much nicer look and feel. Replace your old polished brass builder door knobs with quality lever handles in popular finishes. Choose from many styles and finishes. We have great deals on discount door levers that will give your home and inexpensive quick fix to make it easier to sell or just better looking without spending as much as you would have to with more expensive door hardware brands. There are various different types of door levers available on the market today made by manufacturers around the world. Door hardware is an integral part of our daily life, yet something most of us think very little about. Here on DirectDoorHardware.com you can purchase door levers of just about any configuration that you need from replacing old vintage locks to the latest keyless levers. Some of us only buy lever handles just a few times in a lifetime. Others who have buult homes or remodeled many times will purchase door levers throughout their life. Whichever situation you find yourself in, it's worth taking a look at the different types of levers. Door levers are available in 4 main functions suited for specific residential applications. We also supply commercial door levers, but we'll cover the available options for commercial door hardware in another article. First lets go over the options available for residential use. Generally used on exterior doors or really any door that needs the added security of a door lock. These locking door levers have a keyed cylinder on the outside and if locked, require the user to have a key for entry. From the inside of the lock you can lock the door using a turn button, or push button/pin (depending on the brand). Some keyed entry locks will have a panic release feature where from the inside if the lever is turned the lock is deactivated for exit. Weslock Levers all have this panic release feature on keyed functions. If a lock does not have this panic release feature, you must turn the button to the unlocked position or the lever will not turn to disengage the latch mechanism. If you have several keyed locks in your project, we can key all locks alike if you wish. Passage locks do not lock. These are generally used on hall doors or closets that do not need to be locked, but still need the functionality of a working door lever on the door. Sometimes passage levers are used on exterior doors where a deadbolt is mounted above. Privacy door levers are generally used on bedrooms and bathrooms for privacy - of course. These types of door levers have a locking mechanism, but don't have a keyed cylinder on the outside like an exterior lock. Privacy locks are not as secure as keyed entry locks because you can easily pick the lock open with a generic tool provided with the lock, a hairpin or paper clip. This capability to unlock is required so that you can gain access to a room should a child lock themselves in or similar circumstances. Like keyed entry locks, privacy levers have a turn button or push button/pin (depending on the brand) on the inside of the door. You can find this panic realease feature on Weslock and Emtek brand door locks. Dummy door levers are generally surface mounted to the door and do not have a latch mechanism of any kind. Dummy door levers are sold individually or in pairs (depending on the brand). 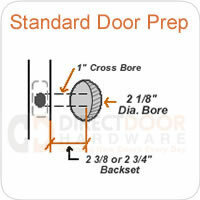 On Direct Door Hardware's website it will tell you in the function menu whether the item is sold as a single dummy or dummy pair (double dummy). When ordering door levers you have to determine handing for most styles of levers. Because of the unique styling of levers, if you install a left handed lever on a right handed door the lever design would be upside down. Determining door handing is easy. You can read more on our door handing guide. If you just don't want to mess with it, Schlage and Kwikset levers are designed to be reversible and you're only required to specify handing on dummy sets.